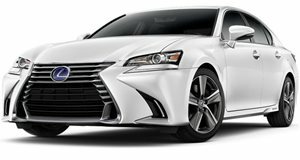 In a world of low displacement turbo moors and plug-in systems, the Lexus GS hybrid is a little old school. Combined power outputs of 338 horsepower are derived from a 3.5-liter V6 and two electric motors – with drive being sent to the rear wheels through a CVT gearbox. There is no all-wheel drive option. The F-Sport package equips the GS450h with larger alloy wheels, F-Sport styling cues inside and out, F-Sport seats, and sportier suspension with adaptive damping. Safety features include lane departure alert and forward collision avoidance with pedestrian detection. 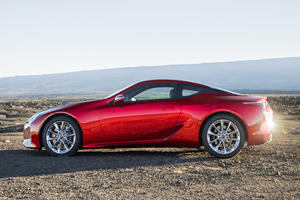 Lexus may do things half-heartedly when it comes to performance; at least with F-branded models; but when it comes to hybrids they’ve been in the game a lot longer than most. After all, parent company Toyota pioneered the mass-market Prius in an era where hybrids were barely a thought for others. 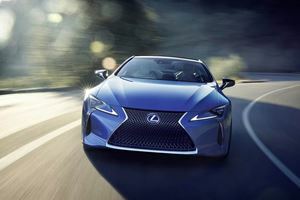 The Lexus GS Hybrid, then, is the antidote to the GS F. Pairing a V6 with two electric motors and a CVT goes against the philosophy of the BMW 5 Series hybrid, but experience may prove to be to Lexus’s benefit in this battle. As is standard for Lexus products, ergonomics are on point – the GS hybrid is a sedan designed with rear people in mind. Door openings are large for easy ingress and egress, and once inside the space is generous. Up front there’s ample head and leg room, and the seats accommodate even those with broader dimensions. The rear seats are much the same; only those exceeding 6 feet in height by some margin will find it tight back there. Like most hybrids though, the battery pack in the GS diminishes cargo volume quite substantially. In the hybrid, total volume is just 13.2 cubic feet – the standard model boasts 18 cubes – but its biggest fault is that the rear seats don’t fold, limiting cargo volume further. Overall quality is high, with numerous materials used throughout the cabin – all of them luxuriant. But the Remote Touch infotainment setup is a big letdown in its lack of practicality and confusing operation. The antidote to the GS F doesn’t mean the GS450h loses all that made the hot version endearing – those traits are inherent across the line-up. The suspension is comfortable yet tied down, offering ample springing and damping to filter out large and small bumps, but without creating a harsh ride. 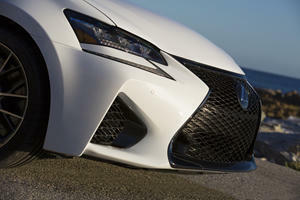 The optional F-Sport package adds adaptive suspension that makes the rid even more comfortable, and more competent. Body lean is ably resisted, though still present. In Sport+ mode, the ride becomes stiff, but is less jarring than the likes of the Mercedes-Benz E Class. Where the GS450h lacks compared to its performance-orientated brother is steering feel. The weight is programmable, but overall feel is fairly muted. Still, the responses are direct, and with the adjustable weighting the GS450h works flawlessly on the open road or in tight parking lots. Unlike rivals who take on a downsizing mantle to their hybrid drivetrains, the GS450h pairs a 3.5-liter V6 to two electric motors for combined outputs of 338 horsepower and 257 lb-ft of torque. The GS hybrid is available only with rear wheel drive, with a continuously variable transmission (CVT) shuffling about to help deliver the torque efficiently. The EPA rate the GS450h at a combined 31 MPG, better than the BMW equivalent by 2 MPG. Performance is spritely too, with 0-60mph taking just 5.6 seconds – proving both economical and rapid. But, there is no electric-only mode. The GS450h is available in only one trim, though a F-Sport option pack provides almost a second trim line. Standard equipment is generous, with a sunroof, keyless entry, heated and ventilated power front seats, a rear-view camera, navigation, and Smartphone integration. The F-Sport package includes 19-inch wheels, adaptive suspension, sport front seats, and extra trim both inside and out. The GS450h features the Lexus Safety System + suite of features, which includes blind spot monitoring, rear cross traffic alert, lane departure alert, and adaptive cruise functionality, helping the GS score best possible scores of Good in the IIHS tests it has been evaluated on. With no electric only mode, the GS450h lags behind the times, but it’s exciting to drive, offers comfort in abundance, and impressive safety features. It’s no GS F, but it’s one of the best GS models you can buy, and worth a look versus competitors in segment. Is that conservative image finally done and over with? Hybrid Lexus models may finally be worth the price premium.